It is time to take a closer look at some of this year’s candidates. Let there be no doubt: Participants starting and finishing the Finnmark Race (‘Finnmarksløpet’) are all winners. All race classes are demanding. Participants should maintain good animal welfare while master a series of challenges before they can cross the finish line downtown Alta to the sound of ‘Conquest of Paradise’ by Vangelis. In this article, we take a closer look at some of this year’s participants. Most of it is about those who might win, though we also mention some well-known profiles and some of those who are rookies in this game. First of all: This is the class in which predicting a winner is next to impossible. We are thrilled to have a record-high number of participants in this class for the 2018 race, which also holds the official title of Norwegian Championship, Long Distance, Junior Class. At the time of writing we have 17 participants on our list. The previous record was 14 participants. Mina Skjøthaug Karlstrøm participates for the third consecutive year. She’s from Parken Gård Husky, a kennel that always has great dogs, a feat that in particular her mother Marianne Skjøthaug has demonstrated time and again. Mina has demonstrated excellent mushing skills through all her junior races. This year her good friend and main competitor Hanna Lyrek is no longer the one to beat, as she’s turned 18 and ‘graduated’ to the senior class of the race. We are thrilled to see that many young mushers have taken the long journey from south-eastern Norway up to Finnmark County to participate. One of the young mushers we became familiar with last year is Iver Kolstad. The boy from Røros has accumulated experience and won this year’s Femund Race for juniors. Look out for him! Last year, Tuva Almås surprised many by going all the way to the top. It turned out that she had borrowed a super-fit A-team from a participant who had had to withdraw from the FL-1000. These things happen, and in the junior class of Finnmarksløpet there is little room for tactics. They have a lot of mandatory resting time, so the musher who has the fastest team with the most stamina has a great advantage. Our conclusion? The FL-junior race is full of wonderful youth and winner candidates. There is a new trail route between Jotka 1 and Jotka 2. The leg from Jotka 1 to Kautokeino is challenging, and the race has one less checkpoint than in previous years. These are elements that will make some mushers less secure, and well-worn race plans now have to be scratched. This may also add hope to those who are less experienced, but who have well-trained dog teams and high speed capacity. One thing is for sure; Elisabeth Edland and Harald Tunheim will compete fiercely. Elisabeth Edland is traditionally considered the queen of the FL-500, being the only musher to have won four times. We often refer to her as the world’s best 8-dog team musher. Tunheim has a very strong dog team this year. He has many years of experience from the longer race (‘open class race’) and can boast five victories there. Last year, he made a strong comeback in the FL-500 race and finished third. Jimmy Petterson from Sweden participates in the FL-500 for the first time ever. He has won Amundsen Race three times before, done well in La Grande Odyssée and we are curious to see what he might be up to. Milos Gonda has won the Finnmarkslopet and usually finishes high up on the list whenever he crosses the finish line – some times even on the very top. The Slovakian, who lives in Sweden, tries to lower expectations in his statements on his profile page; however, we are not fooled. Then there is Ronny Wingren from Finland. Finished second in 2017, first in 2014, top 10 four years running. Ronny is definitely one of the favourites this year. There are many we could mention, but the last one we’ll name is Aleksandra Torgersen. She registered late following her partner Fredrik Westlie winning the Femund Race (F400) in February. We are excited to see Aleksandra bringing her four-legged athletes to Alta to compete. Will Dallas Seavey win in his first attempt at the Finnmarksløpet? The biggest news recently is, of course, the fact that the very Dallas Seavey, four-times Iditarod champion, has registered. The very experienced Alaskan is in Norway with 16 of his own dogs and he’s not just here for a run in the park. Can he win the FL-1200 in his first ever Norwegian race? The answer is obviously yes – he may be the biggest favourite of them all. Together with our long-time expert, Trond Ørslien, we have narrowed down a top-5 list for the FL-1200, being fully aware that we may end up in the wrong. Seavey is one of our top 5 picks. 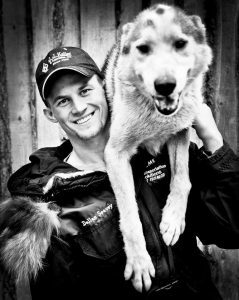 The next one is Thomas Wærner, who raced the Iditarod in 2015t and finished #17, becoming Rookie of the Year. He won the Finnmarksløpet in 2013 and is keen to win again, especially after his slight hit-n-miss in the 2017 race. Another musher we have faith in this year, is Kristian Walseth. He won the Bergebyløpet race three years running, has a persistently solid track record and has a mature dog team. Ralph Johannessen has not impressed us much the past two seasons. Yet we believe that the super-veteran with three Iditarod’s fresh under his belt will be one of the mushers who masters this record-long Finnmarksløpet trail, and he’s an obvious top 5 candidate. The final slot on our top 5 list goes to last year’s winner, Petter (‘Pete’) Jahnsen. Pete has not made too much of an effort in races earlier this season; he has an inner peace following his success in 2017 (he won, as you may remember), and it has often proven true that one has great FL dog teams two years in a row. Four more participants who may win, but in whom we have less faith than the five above-mentioned, are Marit Beate Kasin, Ola Brennodden Sunde, Petter Kalrsson and Birgitte Næss. In our view, it is wrong to direct all attention to those competing for victory. The Finnmark Race – Finnmarksløpet – is also a competition with yourself when you are sleep depraved, when your body aches in places you didn’t know exited and when storms rage around you. A competition against the cold, against wet snow, against rough trails. A fight to not give in, as mushers often say. We want to direct your attention to a couple of names, the youngest first. Ole Henrik Isaksen Eira turns 15 in October. He is the very youngest person ever to have started a Finnmark Race. The young man races with dogs from May Conny and Rune Johansen. It is such an achievement; being so young and all alone with a dog team on the Finnmark Plains. The man with the biggest moustache is also the oldest one in the race. Åsmund Snortheim races the FL-500. 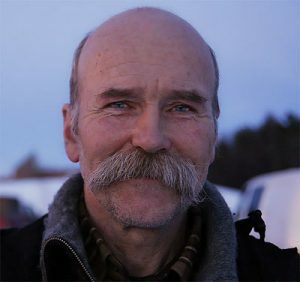 This year’s oldest participant is Åsmund Snortheim (70). The man with the coolest moustache proves that this is a sport you can keep up even if you pass 70 years of age. The man from Trøndelag in central Norway has started the Finnmarksløpet five times; the first of these was way back in the 1990s. Tom Frode Johansen from Troms County tries finishing the Finnmarksløpet for the 20th time, as does Arne Karlstrøm. Only Harald Tunheim and Roger Dahl have finished more than 20 races so far. 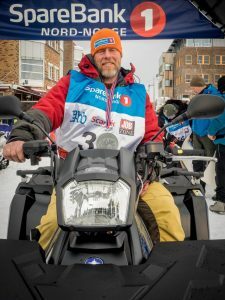 Tom Frode is an excellent ambassador for long distance sleddog racing. The 56-year old has also finished the Yukon Quest, being one out of rather few Norwegians to have done that. In closing, we want to emphasize the international aspect of the Finnmarksløpet. Julie Travadon Coutelier is a rookie. 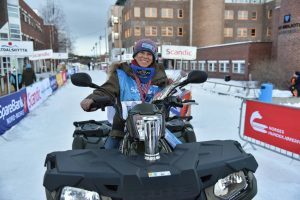 She has spent the whole winter qualifying for the Finnmarksløpet, and says starting the race is a long-time dream of hers. FL-1200 starts Friday 9 March at 19:00 CET. FL-junior and FL-500 start Saturday 10 March at 13:00 CET.